For over 25 years, Timothy has been sculpting large scale sculptures. 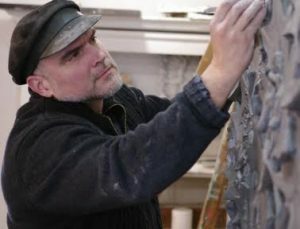 He is a figurative artist with his pieces installed worldwide. Some of his most reputed pieces are installed in historical churches in Rome and at the Vatican. Timothy describes his most important work as visual translations of the Bible. Although most of his work is based upon a spiritual theme, he also creates large, complex public sculptures in bronze. Some of these include monuments that honour veterans and firefighters. Timothy strives to create epic artwork that connects with viewers through design and details that not only touch the viewer on an emotional level, but also allow them to feel somewhat a ‘part’ of the piece. I am devoted to creating artwork that glorifies Christ. The reason for this devotion, apart from my Christian beliefs, is that an artist needs an epic subject to create epic art. I describe my sculptures as being visual prayers. When I create a three dimensional sculpture in bronze I am quite aware that it will last longer than myself. I realize I am between two things that are much more durable than myself: Christianity and bronze metal. It is between these that I have developed a subtle appreciation for what Saint Francis meant by “instrument”. It brings me happiness when my sculptures are installed outside; three dimensional bronze works of art are excellent advertisements for any Christian Church. The best compliment these sculptures receive is to amaze and fascinate the most cynical youths of today. If they think that the art is amazing, they will have to think that the message is as well; a ‘cool’ sculpture outside a church may make them think that, likewise, something ‘cool’ is to be found inside the church. My purpose is to give Christianity as much visual dignity as possible. Christian sculptures are like visual sermons twenty-four hours a day. Saint Gregory the Great wrote that “art is for the illiterate”; the use of images was an extremely effective way to educate the general population. Our contemporary culture is in the same state today, not because of illiteracy, but because people are too busy to read. In this world of fast paced schedules and sound bites, Christian art creates “visual bites” that introduce needed spiritual truths in a universal language. Christian sculpture acts for many as a gateway into the Gospels and the viewer’s own spirituality. After looking at an interesting piece of art the viewer is curious. “Who is this man on a cross? Why does he suffer?” The more powerful the representation of the art, the more powerful the questions become. Creating art that has the power to convert. Creating sculpture that deepens our spirituality. Attaining these two goals describes my purpose as an artist.